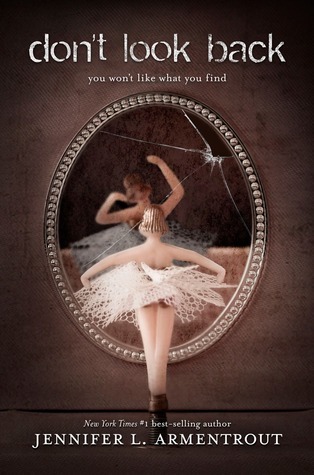 Don't Look Back by Jennifer L. Armentrout, and surprisingly for me, not part of a series. Samantha is a stranger in her own life. Until the night she disappeared with her best friend, Cassie, everyone said Sam had it all- popularity, wealth, and a dream boyfriend. Sam has resurfaced, but she has not recollection of who she was or what happened to her that night. As she tries to piece together her life from before, she realizes it's one she no longer wants any part of. The old Sam took "mean girl" to a whole new level, and it's clear she and Cassie were more like best enemies. Same is pretty sure that losing her memories is like winning the lottery. She's getting a second chance at being a better daughter, sister, and friend, and she's falling hard for Carson Ortiz, a boy who has always looked out for her-even if the old Sam treated him like trash. But Cassie is still missing, and the facts about what happened to her that night isn't just buried of Sam's memory- someone else knows, someone who wants to make sure Sam stays quiet. All Sam wants is the truth, and if she can unlock her clouded memories of that fateful night, she can finally move on. But what is not remembering is only thing keeping Sam alive? 1. I am a big fan of JLA's Lux series, so naturally I had to try this book out. It is a very different from Lux, but still wonderfully written. It is definitely a thriller that will keep you guessing on what really happened to Sam and Cassie. 2. Love that this book shows how complex the human brain is by the way Sam losses her memory, and the way things come back to her. It is really fascinating to see how the puzzle pieces of Sam's life come together, and how sometimes she has the piece but has no idea where it goes. 3. Like Sam's character. She truly is a character that gets to right her wrongs because life before the incident, she was a real witch. She is amazingly strong and determined despite remembering nothing, she does not spend time going woe is me. 4. Liked Sam's brother Scott. He was cute and protective of his sister, even though she had not always been very nice to him. 5. Loved Carson! He is kind, smart, and always looking out for Sam. He knows her so well, even when she was a horrible person, he knew she was better than the way she acted.